The Battle of Waterloo saw many men and horses being horribly wounded and sometimes even waiting days for being attended to, or put out of their misery. 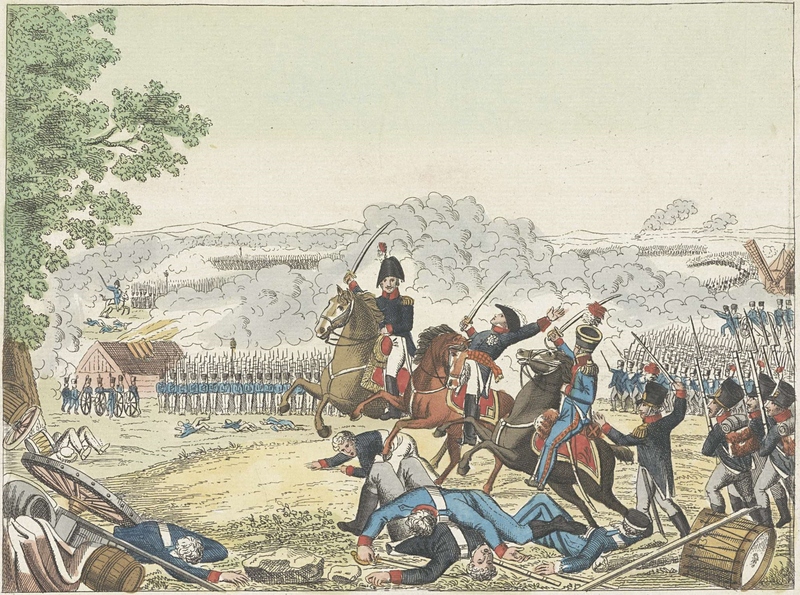 Did General Chassé at the end of the Battle of Waterloo charge with his brigade commanded by Colonel Detmers charge against the French Garde Impériale? Would you like to know the answer? Read more about how the men and officers from Detmers' brigade charged down the slope of Wellington's position at the end of the battle?! Do you want to know the perspective of the Netherlands troops during this final part of the battle! And also have the part played by the British troops in this critical episode of the battle acknowledged? In that case wait for our next Volume Three, in which we positively describe how Chassé DID NOT charge against the French guards battalions. And at the same time read what happened exactly. It is an intrigueing history!!! Volume Three is almost there for you to order!!! The Prince of Orange received much claim for his personal conduct during the Battle of Waterloo, in which he was wounded. This showed how he as oldest son of the new king had been willing to to put his own life in danger for the sake of the young state of the United Kingdom of the Netherlands. The prince's endeavours at Waterloo and his wound personified the new bonds between the people of the Netherlands and the Orange family. Moreover... the final battle to destroy Bonapartist France was delivered on Netherlands soil! What a great honour this was... and still is. King & Country.. a wounded prince..., a Hero of Waterloo... a new country was born and its people received their first victorious laurels! 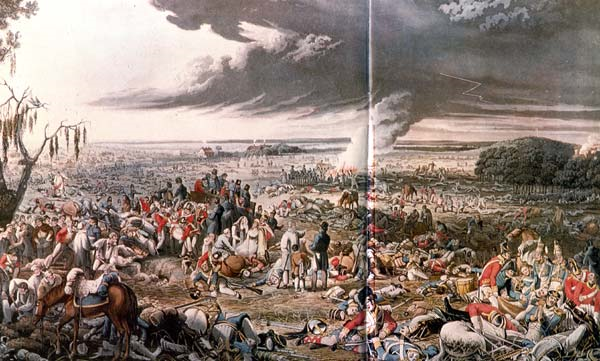 Read here what Major-General van Reede witnessed when the Prince of Orange was wounded in the final stages of the Battle of Waterloo. 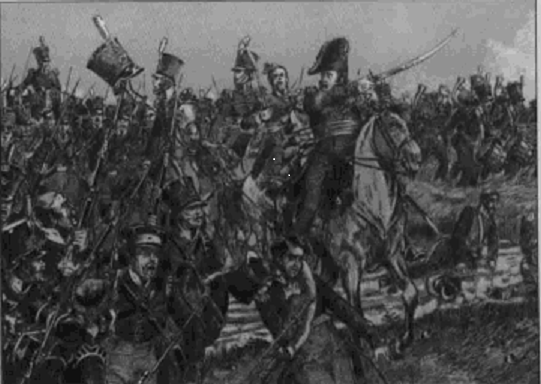 More ofcourse in our next book "Standing firm at Waterloo"! With gratitude and recognition I return your work about the last Campaign, I have read it with the utmost pleasure and am convinced of the general approval, it will receive concerning the exactness of the deeds * [note left of the letter: * I would not know what to add], I only need to edit pag. 189. That the Prince was carried from the Battlefield lying in a woollen blanket by, as I think, 8 or 10 Hanoverian soldiers, that first on the highway to Waterloo one tore a door from a house to place him on it and that it was moments before this that I took the opportunity when he opened his eyes on which occasion he recognised me, to ask him about how he felt of his wound, and I received the answer. The Prince was not covered with a cloak; while put on the door, he mostly sat straight up with various isolated [men] whom we met there and who had left the battlefield to return to their corps [= battalions], predicting them the good outcome and entrusting that the participation in the Battle of the Corps of General Hill, which then first took place since a short moment, would turn the affairs entirely into our favour. General Alava may have followed the Prince in the first moments, but was no longer there when I arrived, he left the battlefield almost ½ hour later when one of his best friends Lord Fitzroy Somerset, adjutant of the Duke, was so dearly wounded that one had to amputate both his arms in the [house] where the Prince was and before he, as I remember well, was bandaged. Perhaps one has mistaken the Russian General and Minister Pozzo di Borgo, with whom I rode along the entire day, for mister Alava. We proudly present you the first design of the cover of our Volume Three! Combined with the cover of our previous two volumes you will notice the theme of the red, white and blue of our national colours. Exactly as we earlier on already told! And as we stated before.... all three covers portray the Prince of Orange, the commander-in-chief of the Netherlands field army in the campaign. How nice will this look on your bookshelve! Especially when the fourth volume shall be presented with an orange background, representing the royal pennant of the Orange-Nassau family. We hope this fantastic collection of books will be part of your collection of books on the Napoleonic Wars and the battle of Waterloo! During the two hour long episode of the cavalry charges there was a brief pause halfway, during which several French horsemen taunted their adversaries. Some men to men duels were fought in front of the positions, among which three recorded incidents with cavalrymen from the Netherlands regiments. Take a look here of how we present this in our soon to be published Volume Three. An odd spectacle now took place as the regiment advanced and came opposite the 12ème Cuirassiers. This regiment, of which the bulk of the old 14e of that arm, the former Dutch cuirassiers of Colonel Trip had been attached to, counted many old comrades-in-arms among our ranks, who recognised eachother and called their names. This was especially the case with a certain dragoon Jansen, called the funny one, who was called from all sides. While standing in line, uninterruptedly these cuirassiers and chasseurs of the 6ème Régiment, standing close by, rode along the front and fired their pistol or carbine on the regiment and challenged ours to a duel. And although this was accepted by many of ours, many of our young men were nevertheless not experienced in it. On this occasion Captain Maschek was killed, while he was busy sending some of his men forward and the horse of Lieutenant Muijzer was wounded. Lieutenant van Eupen commanding the 2nd platoon of the 3rd squadron was affronted by the taunts of the trompette-major of the 6e Régiment des Chasseurs à cheval, who came to the front in a defiant manner and expressed insulting remarks, and took his chance to charge the trompette-major and drove him back to his regiment with a few sabre cuts. As he returned his horse was shot dead and he collapsed and a voltiguer from the 2nd [sic] Nassau Usingen Regiment rushed to the front and took our brave Lieutenant van Eupen into the square and he soon rejoined the regiment, took his position mounted on a troopers horse.